Communicating with parents throughout the year is something we all have to do, but sometimes it’s hard to know how to do it well. Good communication takes a lot of time and effort, and if you don’t have a system for it, it’ll drive you crazy! I’m going to share my best tips for keeping parents in the loop so that you have a good working relationship and healthy rapport with all of your students’ parents. I'm also sharing a bunch of FREEBIES (and a few... inexpensive-ies? Is that what I should call them? ), so don't miss out on downloading all of the goodies! 1. 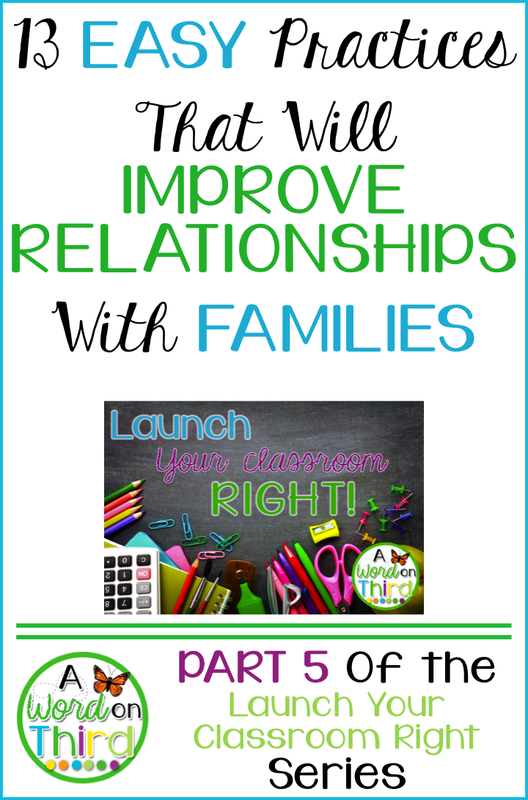 Start referring to all of your students’ parents as families. This may sound silly, but I think this subtle language shift made a big difference in my classroom. All families are different, and it can alienate some families if you just call a guardian a “parent.” What about step-parents, grandparents, and other adults raising kids? I think referring to parents and caretakers as “Families” in your newsletters and emails sets a more inclusive tone right from the get go. 2. 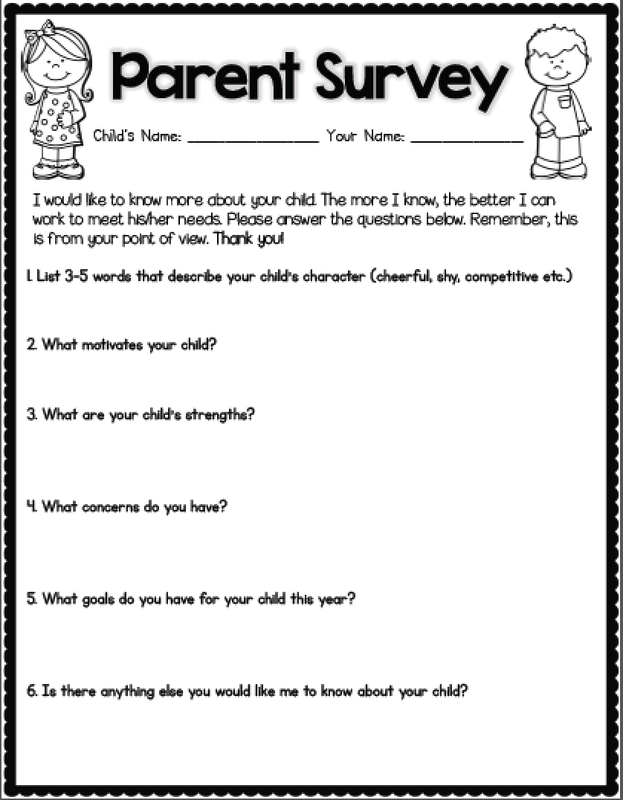 Send out a questionnaire about each student at the beginning of the school year. At the beginning of the year, I send out a questionnaire that asks a few important questions to each family. I ask about worries the family has, challenges the child has, hopes each family has for their child, etc. I ask if there are any concerns families want to share with me, and that section especially tends to be very telling. I put it in my welcome letter and ask that kids bring it to school on the first day, but I will send additional papers home to parents who do not fill it out. Read these, be aware of their content, and communicate about any relevant information. Here's an example of one found from a quick Pinterest search. Click the picture to download it. 3. Give families a way to contact each other. I also send home a contact sheet so families can communicate with each other outside of school. On each contact sheet, I ask for parent names, email addresses, phone numbers, and home addresses. Eventually these forms will be compiled (hopefully by a parent volunteer) and turned into a Class Phone Book. I also put a box at the bottom of the page that parents have to check if they want to be included in or excluded from the phone book, but I require that they fill out the contact information regardless so I can communicate with families. So far, I’ve only had one family choose not to be included in the class phone book. 4. Make positive contact with each family within the first week of school. Without fail, I reach out to each family in the first week of school to say something great that their child did. It can be as simple as noticing that someone shares well or is polite. A mere 4 or 5 sentences in an email will go a long way. Once I did this and a parent cried to me, stating that they had never received a positive email or phone call from any of their child’s previous teachers. I realized at that moment that my extremely small effort made a huge impact, and was worth repeating. Keep a clipboard handy during the first week so you can jot down things you see. By the end of the week, you’ll have at least 1 thing about each child you can send. I don’t care if your email is the same few sentences for every student. As long as there is SOMETHING unique about each student, it’s great. All you have to say is, “Dear ___, I wanted to reach out to you to share some good news about ___. Today I noticed ____. I’m so excited to continue getting to know ___ this year. Sincerely, You.” BOOM. Done. 5. Send home a meaningful weekly newsletter. 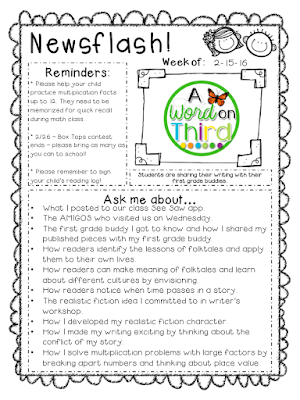 Newsletters are SO IMPORTANT since they let families feel like they are involved in their child’s learning experience, but ironically, every teacher I know tends to hate writing them. They say that they are either too time consuming, that they worry about what to say… the list goes on. Guess what? 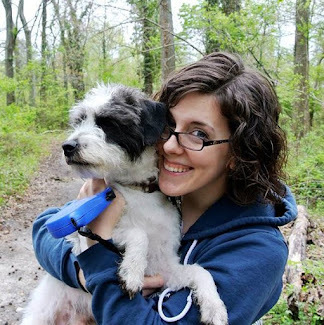 If you hate writing newsletters, you’re doing them wrong. 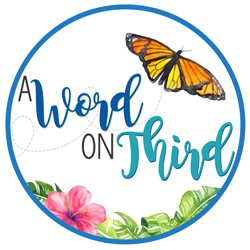 In a previous post, I shared how to make a meaningful newsletter that teaches families about what’s going on in the classroom, is short enough that they do not get overlooked, reminds parents about important upcoming events, and, best of all, ONLY TAKES YOU 5 MINUTES TO FINISH. Yeah, I’m not kidding. That five minute investment each week does wonders for my classroom. Read how to do this by clicking the picture below. 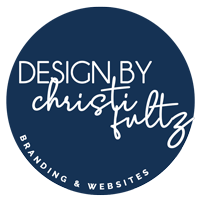 If you really don't feel like doing it yourself, download my template for under a dollar. 6. Send home an individualized reflection of each student’s own learning to each family. 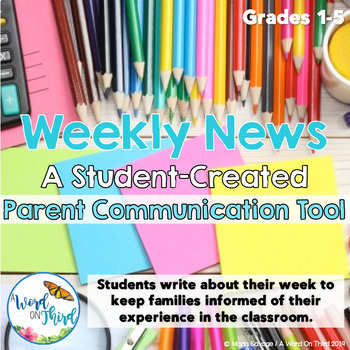 While newsletters give families a great snapshot into the classroom, it’s important to let families know about how each child is doing as an individual too. Sending some a child's written self-reflection lets families see how each child perceives school. This won't be the end-all and be-all: a child's perception will differ from yours sometimes. However, families still need to know their child's perception of school. I have a weekly exit ticket you can use to accomplish just that. Every family member who reads it will now have more information to have a meaningful conversation with his/her child. It’s free, and after you’ve taught your students how to fill out a meaningful exit ticket, it will only take them a few minutes. I assign it as morning work on Fridays. Download my exit ticket by clicking the picture below. 7. 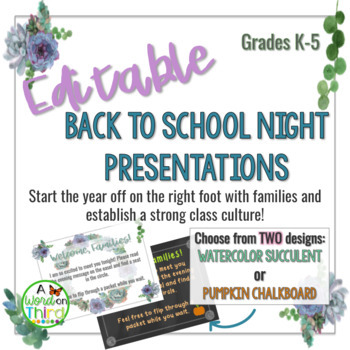 Set your class community’s tone at Back To School Night. I like to do this by setting up Back To School Night like a Morning Meeting. I’ve written about that already here. I suggest you read it! If you are a believer in Responsive Classroom and you implement a daily Morning Meeting, including one in your Back To School Night will show your families how your classroom runs. They will have a feel for how you are as a teacher, and they will feel comfortable with having their child in your classroom. I will be writing more about Back to School Night in my next post, but for now I'll tell you that parents tell me this is a blast. It was also the least stressful Back To School Night for me! Should you choose to go this route, which I recommend, I have an editable Back To School Night presentation available to you to use. 8. Give families a chance to be involved. On Back To School Night, I ask for family volunteers for all sorts of things. More often than not, most families like to be involved in their child’s learning. Due to all sorts of limitations, some family members can’t be involved in typical ways. I make sure to give all family members some option to help out or feel involved. I ask for class parents/family members, chaperones, and volunteers at Back To School Night. I always ask for more than 1 class parent so more than 1 parent can be involved. This also lightens the load for each helper, which is often appreciated. I also have a Back To School Night wish list, which includes a few things that will make the year easier (Barnes & Noble gift card, Amazon gift card, books for the classroom library, etc.). When I need more supplies later on in the year or I want to invite family members in for an event, I send out a editable Google Doc so families can indicate preferences or tell how they are able to help out. The little things make a big difference here. By starting the year with this, parents feel heard. You can’t be expected to give a proper parent-teacher conference after knowing a child for just a few weeks. Sure, maybe you've got a reading assessment, but you don't know that child the way you do after several months. The family members are the true experts on each child (especially at this point in the year), so ask them for their input. What do they want to see? What social-emotional and academic goals do they have for their child? I ask parents to come prepared to conferences with these 2 big goals in mind and we brainstorm ways we might meet them. Sure, I will show some student work and state what I’m seeing, but goal-setting makes a bigger impact in the beginning of the year. If your school doesn’t hold conferences at the beginning of the year, can you make phone calls during your prep periods or make one at the beginning of the day or end of the day? After a few weeks, you can talk to everyone. 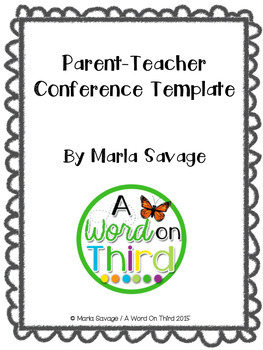 If you’d like to be super prepared for conferences, you can download my free conference template here. By the way, I recommend meeting later in the year with everyone to discuss how goals are being met. Don’t wait until the very end of the year, because if a goal hasn’t been met, you can’t do anything to try to address it. I've got a free conference-planning template here for you, which has space for those goals. Click the picture to download it in my store. 10. Be aware of language barriers. If you are sending home emails to a family member who speaks a different language, will they understand everything? Maybe, but maybe not. Think about what you learned in college about emergent readers; it only takes a few unknown words to completely break down meaning. If your permission slip has 1,000 words on it and a parent only understands 90% of it, that means there are 100 words that that parent cannot understand. I guarantee they aren't the little words either. Can you call home if they speak better than they read? Can you get an interpreter to help out? (Foreign language teachers can point you in the right direction if they can't help themselves.) You might want to mention your willingness about this at Back To School Night so nobody feels singled out. Maybe this isn't an issue for you, but it's something to be aware of. 11. Listen to family input and try to hear what is important to each family. At your goal setting conference or at some different point in the year, you might find that your priorities for each student are different than each family’s priorities. That’s OK. Nobody is right or wrong. It's easy to think that you will be open-minded about this, but I've seen some of the sweetest, most empathetic teachers get wrapped up in this. Maybe you think homework needs to be done when families want kids to play after school instead. Maybe you think kids should play but families stick their child into a Kumon class. Maybe you wish your student would read for 10 minutes every night and you're frustrated that that parent won't sit down and read with his/her child every night. Perhaps the parent is not sharing that he/she is extremely stressed out from working 2 or 3 jobs to make ends meet. You just don't know what's going on at that child's home, and it's important to remember that it isn't our place to judge. Regardless of the reasons behind differing priorities, you need to find a way to hear each other and work together. Every culture is different and values different things—be aware of how you speak to families. 12. Keep parents in the loop as soon as you hear about something. I like to email as SOON as I get info about PTA meetings, school closings, etc. I recommend using the app RemindMe or having a class Twitter account parents can subscribe to so you can text about things that are urgent. It gives parents a chance to plan accordingly. I have heard some very angry parent conversations about one child's teacher giving way more notice about something than another child's teacher. I get that our plates are full... but this is one hill I don't want to die on. As soon as I get an important email to forward, I send it out on its way. This might mean that you need to check your email each day. Spend 5 minutes before and after school every day looking through your inbox. I leave emails I cannot get to right away marked as "unread," but now you will be able to give families as much notice about things as you receive yourself! 13. Give parents more than 1 reminder. If your child can write about something important in their agenda, you can send home a reminder slip about it, and you can send it out in an email or through the RemindMe app, you’re going to have some happy families. We all know life is busy, and while some of us are more organized than others, everyone has moments where they forget things. I happen to like getting text messages to remind me of things, whereas someone else might like having a paper copy to put on their fridge. If we teach for all learners, we need to communicate with all learners when communicating with family members. It's not over-kill--it's consistency. What is your go-to trick for forming good relationships with families? Share your awesome tricks with everyone below!